Being the first new Rockstar game in five years, it feels like the entire world has stopped what they're doing to check out Red Dead 2. The sequel to 2010's original (or the closing of a trilogy if you count Red Dead Revolver), Rockstar have gone all out creating one of the most stunning, lifelike, realistic and shockingly visceral depictions of the wild west in entertainment history. 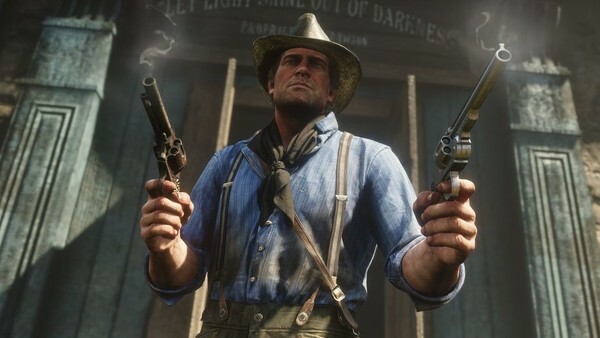 Pedestrians go about their daily business; saloons and sheriffs supply sherry or sanctions in equal measure, with you and your steed wandering through town, enacting the will of one Arthur Morgan. Contrasting the first RDR by being - at-times - painfully laborious and weighty, quickly you realise this is the game's biggest strength, as it highlights all the instances of action or companionship Morgan and the accompanying Van Der Linde gang go through. Campfire parties, robbing trains, playing poker, chasing down bounties - the contrast between these two elements is the wild west, and it's a sensation you'll drink in for hundreds of hours. With that in mind, there are tons of gameplay features, and many you'll have to seek out yourself.